Identification of cell types in bovine tissue sections is complicated by the limited availability of anti-bovine antibodies, and by antigen retrieval treatments required for formalin-fixed tissue samples. We have evaluated an antibody and lectin panel for identifying major cell types in paraffin-embedded bovine tissue sections, and report optimized pretreatments for these markers. We selected 31 useful antibodies and lectins which can be used to identify cell types of epithelia, connective tissue, muscle, and nervous tissue, as well as cell proliferation and apoptosis. 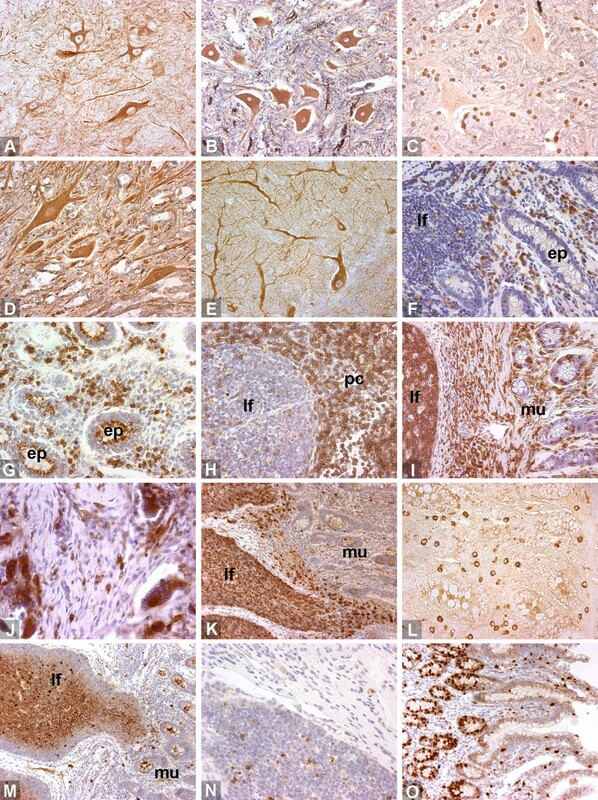 The panel of markers allows the identification of all major cell types in paraffin-embedded cattle tissue sections by immunohistochemistry or lectin histochemistry. Heat-induced epitope retrieval methods are required for most antibodies. Specific identification of cell types in bovine tissues is hindered by the limited availability of anti-bovine antibodies. The species cross-reactivity information of other commercially available antibodies is also often limited. Thus, suitable antibodies must be searched for by trial and error. This is further complicated by the fact that for many antibodies a successful immunostaining is only accomplished after an optimized antigen retrieval treatment. As a by-product of a research project on stem cell fates, we have evaluated a selection of antibodies for identifying major bovine cell types in paraffin-embedded tissue sections. Some of these have been raised against bovine antigens, some are previously known to be bovine cross-reactive, and others we have tested without such prior knowledge. Optimal antigen retrieval methods for each antibody are reported. In addition to antibodies, two lectins are presented. The emphasis is on paraformaldehyde-fixed tissues, but as some antibodies are incompatible with such material, we have also used ethanol fixation. The marker panel is summarized in table I, with results from various antigen retrieval treatments tested. Succesfully stained tissue sections are presented in figures 1 and 2. The results are further commented below, including notes on any nonspecific staining detected. Evaluation of markers. ++: good staining (strong, specific), +: poor staining (weak or including non-specifically stained cells), -: unsuccesful staining. PFA: paraformaldehyde fixation, EtOH: ethanol fixation. N: no epitope retrieval, P: protease-induced epitope retrieval, H3: heat-induced epitope retrieval (HIER) at pH 3, H6: HIER at pH 6, H9: HIER at pH 9.5. Methods: A = avidin-biotin-complex, T = tyramide signal amplification. NF = neurofilament. Sources: DHSB = Developmental Studies Hybridoma Bank, BD = BD Biosciences, N/L = NeoMarkers/LabVision, Vector = Vector Laboratories, W/H = Witten/Herdecke University, Ch = Chemicon, SM = Sternberger Monoclonals, b/C = bAbco/Covance, VMRD: Veterinary Medicine Research Diagnostics, SC = Santa Cruz, BL = Bethyl Laboratories, Bm = Biomeda, CST = Cell Signaling Technology. Staining examples 1/2. A. cytokeratin HMW, epidermis. B. cytokeratin, pan (polyclonal), epidermis. C. keratin, pan (AE1/AE3), intestinal epithelium. D. keratin, pan (Lu-5), liver. E. lectin GSL I-B4, kidney. F. lectin ML-I, brain. G. von Willebrand, granulation. H. procollagen type I, skin. I. vimentin, skin. J. actin (muscle), intestine. K. actin (smooth muscle α), intestine. L. desmin, intestine. M. CNPase, brain. N. GFAP, brain. O. NeuN, brain. pa: parenchyma, bd: bile duct, rc: renal corpuscle, sg: sebaceous gland, hf: hair follicle, mel: muscularis externa (longitudinal layer), mec: muscularis externa (circular layer), sm: submucosa, mm: muscularis mucosae, mu: mucosa. Staining examples 2/2. A. neurofilament (160/200 kD), brain. B. neurofilament (pan), spinal cord. C. S100, brain. D. tubulin βIII (polyclonal), spinal cord. E. tubulin βIII (TU-20), brain. F. CD11a/18 (BAT75A), intestinal mucosa. G. CD11b, intestinal mucosa. H. CD3ε, lymph node. I. CD45 (CACTB51A), intestine. J. CD68, granulation. K. CD79αcy, intestine. L. IgA, intestinal mucosa. M. IgM (Big73A), intestine. N. cleaved caspase 3, intestinal lymphoid follicle. O. Ki-67 antigen, intestinal mucosa. lf = lymphoid follicle, ep = epithelium, pc = paracortical area, mu = mucosa. Several anti-keratin antibodies were evaluated for epithelial markers. The AE1/AE3 monoclonal antibody cocktail[2, 3], raised against human epidermal keratin, was the most useful pan-epithelial marker. With alkaline antigen retrieval (see Methods), most types of epithelia were strongly and specifically stained with this antibody. Neutral or protease-induced retrieval was sufficient for some but not all tissues. Another pan-keratin antibody Lu-5 also stained most epithelia with protease-induced retrieval, but did not cover all epithelia as comprehensively as AE1/AE3 in our hands. The polyclonal pan-keratin antibody tested yielded nonspecific staining of cells. The high molecular weight cytokeratin antibody 34β E1 provided very strong staining of some epithelia (notably epidermis and liver), but is obviously not as comprehensive as the pan-keratin markers. Few bovine endothelial markers are available. The anti- von Willebrand antibody tested stains many but not all endothelia. Notably, new blood vessels in granulation tissue were strongly stained. The lectins ML-I and especially GSL I-B4[8, 9] yielded strong staining of endothelial cells, but they also stain some leukocyte populations. We failed to obtain a good staining with the anti- type IV collagen antibody M3F7 or with the polyclonal anti- endothelial nitric oxide synthase antibody. Vimentin is a general marker for cells of the mesenchymal lineage. The monoclonal anti- porcine vimentin antibody V9[12, 13] provided strong and specific staining even without antigen retrieval. The type I procollagen antibody SP1.D8  stained active fibroblasts in various connective tissues. The best staining was obtained with the alkaline retrieval method. Some nonspecific staining was seen, in sebaceous glands for example. The desmin antibody D33 stained all muscle types, performing best after neutral antigen retrieval [15, 16]. The muscle actin antibody HHF35  recognizes the alpha and gamma isotypes present in all muscle types. The acid and alkaline retrieval methods yielded optimal results. The α-smooth muscle actin antibody 1A4  stains only a subset of smooth muscle tissues, due to the more restricted expression pattern of the antigen. The circular muscle layer in the intestine was not stained. The neutral antigen retrieval method produced the best results with this antibody. All these antibodies were specific for muscle tissues. The monoclonal anti- NeuN antibody A60  was the most comprehensive neuronal marker tested. It stained most neurons, Purkinje cells being a notable exception. Best results were obtained with alkaline retrieval. Tubulin and neurofilament antibodies are also useful as general neuronal markers. Majority of neurons were stained by both tubulin βIII antibodies  and the pan-neurofilament cocktail, and more restricted subgroups by the neurofilament 160/200 kD antibody, as expected. Astroglia were beautifully stained with the polyclonal anti-GFAP antibody, with most pretreatments. Oligodendroglia were successfully stained with the anti-CNPase antibody 11-5B, whereas the anti-O4 antibody 81 failed to produce any specific staining in our hands. S100 is a more general marker for glial cells. It is also expressed in several cell types outside the nervous system. The microglial cells were very weakly stained with the pan-leukocyte and macrophage markers tested. The mistletoe lectin ML-I yielded successful staining with all pre-treatments. It also stains most endothelial cells. Leukocyte markers are often species-specific, and most commonly used in flow cytometry. Thus, most of the antibodies tested were raised against bovine antigens, but information on histological applications was limited. Of the pan-leukocyte markers, the anti- CD45 antibody CACTB51A worked well on ethanol-fixed material with mild protease treatment, except for the microglia, which were weakly stained. The quality of the CC1 antibody appeared to suffer from a change in the production method during the research project. We tested two CD11a/18 antibodies, of which BAT75A was useful with acid antigen retrieval, while MUC76A failed with any pre-treatment. For lymphocytes, the CD3ε (T cells) and CD79α (B cells) antibodies [29, 30] raised against synthetic cytoplasmic peptides worked well with antigen retrieval, providing a strong and specific staining. The anti- immunoglobulin antibodies successfully stained B cells with alkaline retrieval. Myeloid cells were stained with the anti- CD11b antibody MM10A using acid retrieval or ethanol-fixed material. The macrophage marker CD68 was also useful with protease-treated sections, but did not stain microglia. The CD14 antibody MM61A was only useful with ethanol-fixed material. The polyclonal anti-lysozyme antibody stained a number of cells in the intestinal epithelium, for example, but we failed to confirm the specificity of the staining. The proliferation marker MIB-1[35, 36] yielded good staining with alkaline antigen retrieval. Apoptotic cells were successfully stained with the cleaved caspase 3 antibody using neutral retrieval, although the staining was not very strong. 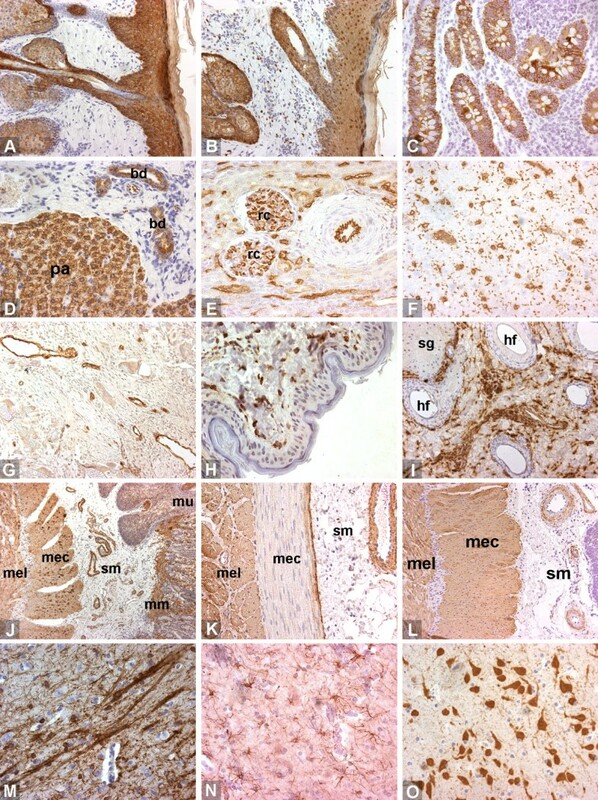 In order to facilitate identification of major cell types in paraffin sections of bovine tissues, we evaluated a number of markers for immunohistochemistry and lectin histochemistry. Antibodies raised against bovine antigens or known to be bovine cross-reactive were used where possible. If no information on bovine reactivity was available, antibodies with broadest species cross-reactivity were selected. Two lectins were used in addition to the antibody markers. The panel of 31 useful markers allows the identification of all major cell types in cattle tissue sections. With paraformaldehyde-fixed material, heat-induced antigen retrieval is beneficial for most antibodies. By selecting a suitable retrieval protocol, most markers can be successfully applied to this type of material. Tissue samples were obtained from slaughtered animals. The use of animals was approved by the animal ethics committee of the University of Helsinki. Tissue samples were fixed either in 4% phosphate-buffered paraformaldehyde (PFA) for 24 hours at +4°C or in 100 % ethanol for 2 hours at +4°C followed by 120 hours at -20°C, embedded in paraffin, and sectioned to 2–4 μm (PFA) or 4 μm (ethanol) sections. All reagents are commercially available. The sources of antibodies and lectins are listed in table 1. Immunohistochemistry was performed using either the ABC method (avidin biotin complex) or tyramide amplification, using Shandon Coverplates (ThermoElectron). Paraffin-embedded sections were dewaxed, rehydrated, subjected to an antigen retrieval procedure (see below), and permeabilized with 0.1% to 1% Tween-20 in phosphate-buffered saline (PBS). The sections were then blocked for endogenous biotin, with 10% egg white powder in water (as an avidin solution) and 1 mg/ml D-biotin (Sigma-Aldrich, St. Louis, MO) in PBS, when necessary, and for nonspecific binding with 1% goat serum in PBS. They were incubated in the primary antibody overnight at +4°C, in PBS containing 1% bovine serum albumin, washed, and incubated with goat biotinylated anti-mouse or anti-rabbit secondary antibody (Dako, Glostrup, Denmark) for 2 hours in room temperature. The ABC detection was performed using the Vectastain Elite ABC kit and the DAB (diaminobenzidine) substrate kit (both Vector Laboratories, Burlingame, CA) according to manufacturer's instructions. For tyramide amplification, sections were incubated in avidin D -conjugated peroxidase (Vector), in biotinylated tyramide , again in avidin-peroxidase, and in the DAB substrate. The amplification typically allows four to ten times more dilute antibody solutions than with the ABC method. All sections were counterstained with Mayer's hematoxylin and embedded with Faramount (Dako). Heat-induced antigen retrieval was performed in a standard kitchen microwave oven. The slides were heated in 500 ml of retrieval solution at 750 W power for 15 minutes (for the caspase antibody, 10 minutes), followed by a cooling period of 20 minutes (for the caspase antibody, 30 minutes). The following solutions were used: for acid retrieval, 50 mM glycine-HCl pH 3; for neutral retrieval, 2 × SSC pH 6 (sodium chloride, sodium citrate buffer); and for alkaline retrieval, 10 mM Tris-HCl pH 9.5, 1 mM EDTA. Protease-induced antigen retrieval was performed in Coverplates, at 37°C for 30 minutes, with 10 to 50 μg/ml (ethanol-fixed samples) or 50 to 100 μg/ml (PFA-fixed samples) protease P6911 (Sigma-Adrich) in 10 mM Tris-HCl pH 7.4, 0.5 mM EDTA. The stained sections were viewed with a Leica DM4000 microscope and photographed using a SIS Colorview 12 digital camera. We thank Kirsi Lahti (immunohistochemistry) and Tuire Pankasalo (histotechniques) for expert technical assistance. This work was funded by grants from the Academy of Finland (210978/10.11.2004 to AI), Ministry of Agriculture and Forestry (project 310099, Dnro 3474/510/2002 to AI), and Finnish Veterinary Foundation (to AI). MN designed the staining tests and optimized the pretreatments, selected most markers, wrote the manuscript and prepared the figures. AE and TPM participated in the selection of markers and in the staining tests. AI participated in the selection of markers and in the preparation of the manuscript. All authors have approved the final manuscript.